THIS ITEM HAS BEEN REPLACED BY ElectrifyRC's T1013 EAGLE. The Lawmate's 1013 transmitter has been completely redesigned and tailored for FPV with a handful of improvements, such as: new switching regulator, ceramic high efficency low profile heat sinks, high quality audio channel, runs 50% cooler than its previous model, lower profile, 10 grams lighter and overall better performance. It's a power house, providing a 1000 milliwatts (1W) of pre RF output. It is the best transmitter for long range applications. (for RC models is recommended to install this as far as possible away from the models receiver) Even with all that power, it weights only around 1.2oz (32grams). With all this, and the right setup, for sure you can get video reception miles away. It is highly recommended to install the transmitter in ventilated areas, to allow the air to keep it cool. This transmitter has digital Phase-Lock-Loop circuit avoiding frequency drift, providing a stable and solid audio and video delivery. You can not go wrong with it. 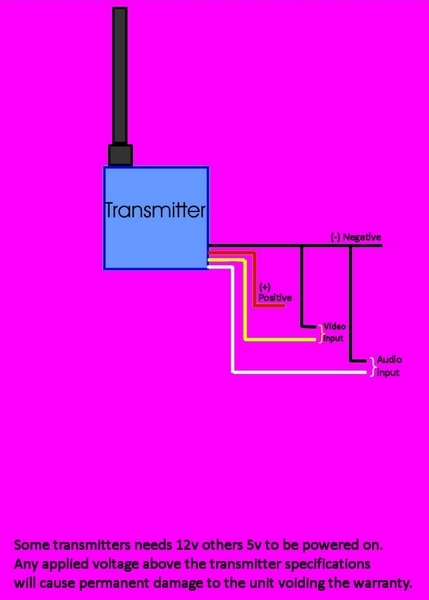 Click here to see the transmitter and camera connections. Simply enter your details below and we will send you an e-mail when “Lawmate 1013 1.2-1.3 GHz 1W FPV Transmitter - (Please read description)” is back in stock!